Faith Freedom International • View topic - QS. 16:79 ; Birds Can Fly, Really Because Evolution? QS. 16:79 ; Birds Can Fly, Really Because Evolution? Re: QS. 16:79 ; Birds Can Fly, Really Because Evolution? Ah, now it makes sense. So you are saying flightless birds evolved from birds that once could fly. Now, what do you think about evolution? manfred wrote: Now, what do you think about evolution? evolution will not happen without a supportive environment! so, no supportive environment, no evolution! So, does the environment "steer" evolution? So is Allah not needed then? Did Allah create something? What? manfred wrote: So is Allah not needed then? you mean, supportive environment is was not set/created by The Designer/Creator? manfred wrote: Did Allah create something? What? everything is set/created by The Designer/Creator, or do you want to prove, that a supportive environment, is a result of evolution, of the environment that does not support? you mean, environment could evolve? you mean, environment could evolve? We have a lot of evidence that environments change. Look at your own country. Some islands have animals would would find in Asia. But other Islands, like Irian Jaya, have animals similar to Australia. Why? Indonesia was not always just islands. There are hundred of examples of environmental changes. So environments change, evolution causes animals to adapt to the changes. We have plate tectonics, climate change, and even changes caused by living organisms themselves, to name a few. because too much of a coincidence, so it is much more difficult to prove otherwise (I mean it does not really come from a what I believe)! manfred wrote: We have a lot of evidence that environments change. Look at your own country. Some islands have animals would would find in Asia. But other Islands, like Irian Jaya, have animals similar to Australia. Why? Indonesia was not always just islands. what I mean is, if the environment it evolved like a living organism, which evolved to maintain its existence (not merely change without purpose)? Some seabirds dynamically soar by repeatedly diving into the valleys of ocean waves, and then wheeling back up into the air. Albatrosses are particularly adept at exploiting the technique and they use it to travel many thousands of miles using very little energy from flapping. When the bird pulls up into the wind out of the still air in the lee of a wave, it suddenly becomes exposed to a head wind, so the speed of the air over its wings increases. It then turns in the other direction and, with the wind behind it, dives back into the shelter of a wave. This also results in an increase in its air-speed. So by repeating this "wheeling" pattern, the bird can continue flying almost indefinitely without having to put in much effort besides steering. In effect it is harvesting energy from the wind gradient. Albatrosses fly long distances over the Southern Ocean, even around the world, almost without flapping their wings; this has raised interest in how they perform such a feat. On a cruise to the South Atlantic I observed albatrosses soaring in a characteristic swooping zigzag flight that appears to combine two soaring techniques to gain energy—wind–shear soaring (dynamic soaring) using the vertical gradient of wind velocity and wave-slope soaring using updrafts over waves. 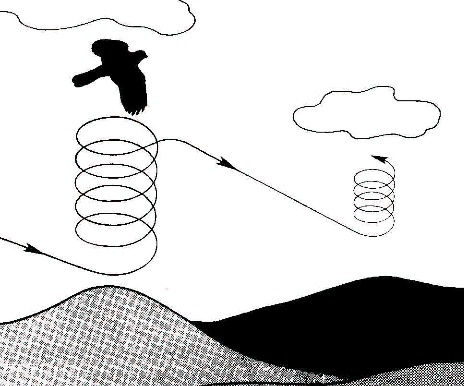 The observed characteristic swooping flight is shown in a new illustration and interpreted in terms of the two soaring techniques. The energy gain estimated for “typical conditions” in the Southern Ocean suggests that wind–shear soaring provides around 80–90% of the total energy required for sustained soaring. A much smaller percentage is provided by wind shear in light winds and significant swell when wave-slope soaring dominates. 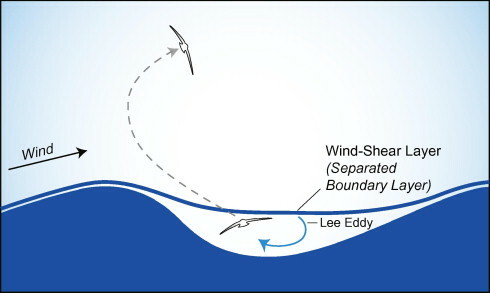 A simple dynamical model of wind–shear soaring is proposed based on the concept of a bird flying across a sharp wind–shear layer as first described by Lord Rayleigh in 1883 and later developed with Pennycuick’s (2002) description of albatrosses “gust soaring.” In gust soaring a bird exploits structures in the wind field, such as separated boundary layers and eddies in the lee of wave crests, to obtain energy by climbing headed upwind and descending headed downwind across a thin wind–shear layer. Benefits of the model are that it is simple to understand, it captures the essential dynamics of wind–shear soaring, and it provides reasonable estimates of the minimum wind shear required for travel velocity in different directions with respect to the wind. 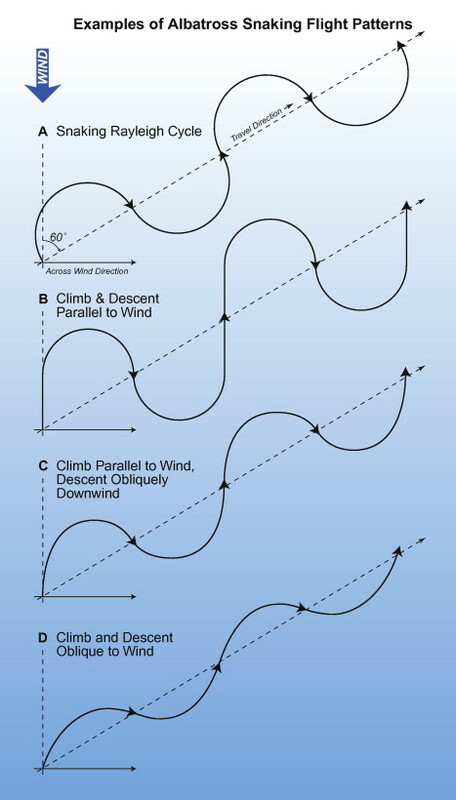 Travel velocities, given in a travel velocity polar diagram, can be combined with tacking to fly in an upwind direction faster than the wind speed located at the top of the wind–shear layer. 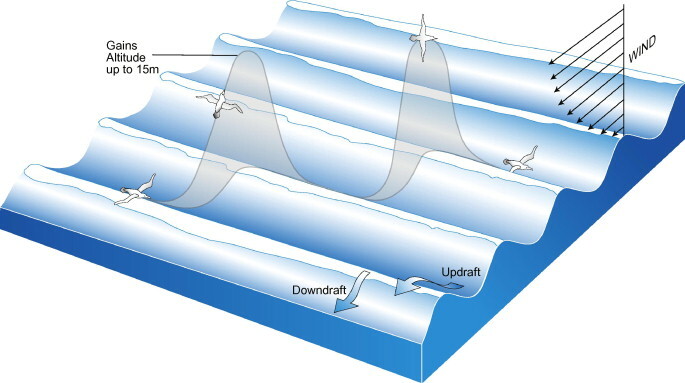 Thermals are updrafts of warm air that rise from the ground into the sky. By flying a spiraling circular path within these columns of rising air, birds are able to "ride" the air currents and climb to higher altitudes while expending very little energy in the process. Solitary birds like eagles and hawks often take advantage of thermals to extend their flight time as they search for food. Social birds that fly in large flocks also use thermals to gain altitude and extend their range during migration. The sight of dozens or hundreds of birds riding a thermal has been said to resemble the water boiling in a kettle, so the terms kettle or boil are sometimes used as a nickname for a flock of birds circling in a thermal updraft. The benefits of thermals are not limited to the animal world either as glider pilots often take advantage of them to gain altitude as well. Guardman you are right it was god who created everything , hold everything in air.......... but it does not help you at all my friend, it does not prove Muhammad was a prophet? Muhammad was still fraud that you can not defend. In another thread, I asked Garudaman if he believed in the concept of indoctrination where beliefs are instilled into the mind. He said "Yes". I have now asked whether he accepts that he might have had a falsehood - Islam - instilled into his mind but I am still waiting for an answer. Yos avoided answering the question when asked. So Allah cannot make a bird fly simply by saying: "be!" ? Allah first need to create air so that birds can fly? Likewise, Allah cannot create some new characteristics or features in existing creatures unless He first change the environment? So it is not Allah who create the 'new' creatures, it's the 'environment' as you said. Which would piss off Allah because Allah hates anyone altering his creation. 4:119 And I will mislead them, and I will arouse in them [sinful] desires, and I will command them so they will slit the ears of cattle, and I will command them so they will change the creation of Allah ." Garudaman wrote: evolution will not happen without a supportive environment! so, no supportive environment, no evolution! sura 30:30 So direct your face toward the religion, inclining to truth. [Adhere to] the fitrah of Allah upon which He has created [all] people. No change should there be in the creation of Allah . That is the correct religion, but most of the people do not know. I knew you missed me, Ahmed. By the way, which part of the quran said that you are to be circumcised in order to be clean? and..which part of No change should there be in the creation of Allah that you failed to understand as a true muslim? We like to talk about your prophet whose mama spent nights with lots of guys. Who the fuk are you, dickhead? Well well well look who is here, buddy Ahmed Bahgat, buddy hope you doing good. Where you been? Bahgat I left Islam and I sincerely suggest you to do the same.